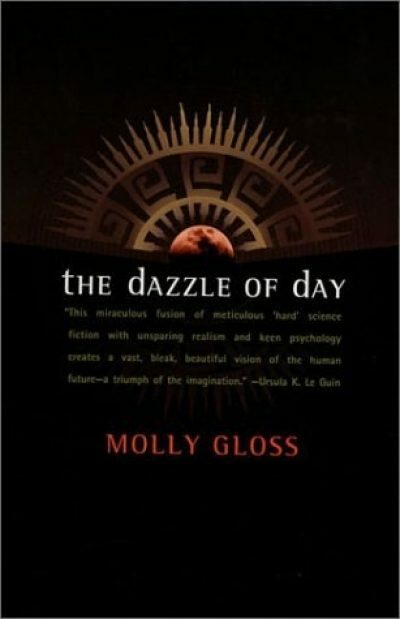 1998’s The Dazzle of Day is a standalone generation ship novel by Molly Gloss. Frustrated with conditions on Earth, a community of Quakers re-purposes an orbiting space habitat. Renamed the Dusty Miller, equipped with vast solar sails, the vessel heads into deepest space for a 175-year journey to another star. Mutiny, mutation, and barbarism: these are the universals for generation ships. Inexplicably, the perfectly sensible measures the Quakers adopt prove effective at preventing the first and the last of the grim triad. A design flaw does burden many of the passengers with radiation-induced birth defects; the Quakers accommodate those as well, embracing a bizarre ethic in which people are considered people. 175 years into their long trek, the target system approaches. As expected, there is a habitable world waiting for them. Also as expected, it’s no paradise from a human perspective. Cold, largely barren, the best the world offers is much like Earth’s arctic regions. After almost two centuries in a controlled environment, the idea of settling the world is daunting. So is the option of heading back out into space in the hope the next world will be more inviting. Which option to pick? It comes down to simple Quaker values…. How big would a solar sail have to be to get a habitat-sized vessel up to the sort of speeds that can cross interstellar space in only generations? It’s not clear to me exactly which star the Dusty Miller is headed to (wherever it is, it’s a singleton star dimmer than the sun but bright enough that tide-locking is not an issue) but the ship’s peak velocity seems likely to be something like 10% of the speed of light, if not more. Impressive for a light sail propelling a fair payload. While the world the Quakers are presented with may seem a bit disappointing compared to other fictional New Worlds, considered against the insanely hostile planets with which we share our system, it’s not so bad. Humans can at least breathe the air, the soil isn’t a high-grade antibacterial and people can wander outside without suffering lethal radiation damage. My one concern is how close the world may be to collapsing into a global snowball. I suppose they could just dump a few megatons of greenhouse gases into the air; no harm ever came of doing that. The author acknowledges CoEvolution Quarterly’s Disco-era round table on space colonies. A 2009 reread suggested to me that CEQ’s contributors tended to take a very optimistic view regarding life support systems, perhaps feeling that any field they did not understand could not possibly be difficult to master. The original owners of the habitat that became Dusty Miller clearly drew on the views of the majority, which is why the habitat’s initial ecosystems collapsed almost immediately and why it was available for the Quakers to purchase second-hand. Gloss’s Quakers draw on the views of the CEQ minority burdened with actual knowledge of and experience with maintaining artificial ecologies. Simple, conscientious, never-ending diligence is why the Quakers were able to transform the dead habitat into the Dusty Miller and keep it running for almost two centuries. While the Dusty Miller may not be useful as an interstellar vehicle indefinitely (thanks to light sail degradation) its useful lifespan as a habitat is indefinitely longer. Similarly, the Dusty Miller does not collapse into civil war and endless violence because the Quakers take steps to ensure that social friction is minimized. This is the sort of behaviour that might seem acceptable — but consider the cost! Because even embarrassing and painful subjects are resolutely faced rather than allowed to fester, there are no intriguing murders to solve, no thrilling sword duels or running gun battles. Nobody is forced into marriage for questionable eugenic reasons; when marriages do break down, the participants do their best to talk it out like reasonable adults. Because they insist on treating even the most disabled as people, no screaming child is ever fed into a matter converter or even thrown out an airlock. This alarming humanitarian approach leads to a novel in which the stories told are personal, short accounts of the people who chose to leave Earth for another world, and their descendants who had to live with the consequences of their ancestors’ lives. The story does not lack crises and tragedies, but those are faced kindly, rationally, and head-on. Perhaps because of how the book violates genre expectations, eschewing viscerally pleasing, knuckle-headed dramatic choices in favour of gentle reason, Dazzle of Day seems to lapsed out of print within a couple of years of publication. The Dazzle of Day is available here (Amazon). Chapters-Indigo lists The Dazzle of Day but does not seem to have any for sale. "They didn’t think much to the Ocean: The waves, they was fiddlin’ and small, There was no wrecks and nobody drownded, Fact, nothing to laugh at at all." Marriott Edgar, "The Lion and Albert", or "Albert and the Lion"